Home > Shop By Brand > Menzerna Polishing Compounds > Menzerna Medium Cut Polish 2400 128 oz. 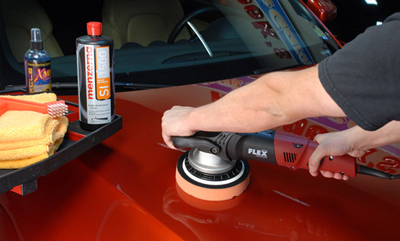 Menzerna Medium Cut Polish 2400 can be used with a dual action or rotary polisher to remove defects quickly. Make sure the surface to be compounded is clean and dry. Fresh paint should be fully cured. Apply Super Intensive Polish out of direct sunlight. Use a wool or foam polishing pad, such as Lake Country’s CCS White Polishing Pad or Orange Light Cutting Pad. The Orange or Green Edge 2000 Pads will also work well with Super Intensive Polish. Apply a 6 inch line of compound to the vehicle. With the polisher turned off, spread the polish over about a 2 x 2 sq. ft. area. If necessary, follow with Menzerna Nano Polish to restore optimum gloss. About Menzerna Polishing Compounds of GermanyJescar Finishing ProductsMenzerna Polishing Cream Metal Polish German Deep Gloss ComboGerman Final Gloss ComboMenzerna Ceramic Intro KitMenzerna Fast Gloss ComboMenzerna One-Step Polish 3-in-1 8 oz.Menzerna One-Step Polish 3-in-1 32 oz. Menzerna Super Heavy Cut Compound 300 8 oz.Menzerna Heavy Cut Compound 400 8 oz.Menzerna Medium Cut Polish 2400 32 oz.Menzerna Super Finish (SF-3500) 8 oz.Menzerna Super Finish (SF-3500) 32 oz. 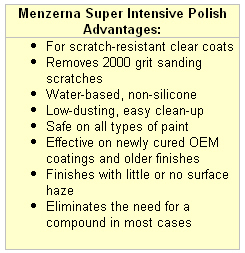 Menzerna Super Finish (SF 3500) 128 oz. Menzerna Super Finish Plus (SF-3800) Menzerna Control CleanerMenzerna Super Heavy Cut Compound 300 32 oz.Menzerna Heavy Cut Compound 400 32 oz.Menzerna Heavy Cut Compound 1000 32 oz.